New Ideas Are Like Icebergs - wendykennedy.com inc. Lately I’ve had a lot of people ask me about how to generate more ideas in their organizations. I’m not sure what’s prompting this but for sure, more people than normal seem to feel they have a “volume” problem – but is this really the problem? In my experience, most of the time, it’s not a volume problem – it’s an iceberg problem. Ideas are like icebergs – a small percentage (they say 10%) rise above the surface and are easy to spot, and the majority stay below the surface and is never seen. It’s easy to mistake these ‘tip of the iceberg’ ideas as being the only ideas in your organization. After all, they are the obvious ones that are talked about in meetings, coffee conversations and monthly progress reviews. But, look below the surface and I think you’ll be surprised at what you see. What’s hidden “underwater” is often more spectacular than the small spike that rises above the surface. 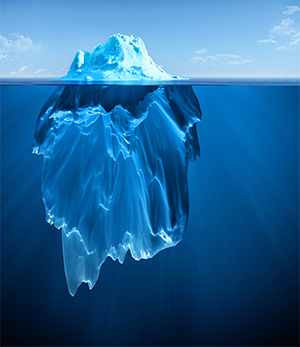 What’s even better — if only a small fraction of the iceberg principle applies to new ideas, there’s tremendous upside to diving below the surface to ignite the full innovative engine of your organization. Don’t Look for Ideas: I know this sounds contradictory to my discussion above, but stick with me. Like any good explorer, you have to look ahead and see what might be coming versus only looking at what’s in front of you. Start by looking at the domain expertise in your organization – engage your innovators in conversations about the “new, new” – what’s on the horizon and what’s coming next? Fall in love with the “R” in your organization – if you are only interested in the “D”(development), then you are largely looking at the tip of the iceberg. The “R” (Research) is what leads you to the “new, new”. Look ahead of the curve and become interested in the work at the bench level that’s shaping this “new, new”. This can also be the starting point for building relationships and trust with the innovators who ultimately shape science and technology into new ideas. Build A Pipeline of Nonconformists, Naysayers and Rebels: People are the heart and soul of the innovative potential of your organization. What’s exciting here is that it’s the people you might dismiss as being contrarian that are the most valuable. Do you have innovators that are non-conformists? Lone wolves? Naysayers? These people hold the potential to be the engines of innovation in your organization. Take a moment to read Adam Grant’s article in HBR on “How to Build a Culture of Originality” – it will challenge your thinking about the type of people to cultivate for your innovation pipeline. Start From a Place of Respect and Trust: If there’s one thing I’ve learned, these two values are fundamental to success. As someone on the business side of the equation, I remind myself that researchers, scientists and engineers are domain experts and not businesspeople. Our goal is to help them build a bridge between the richness of their science or technology and the business opportunity it represents. It troubles me when I see cartoons that mock a scientist trying to have a conversation with a business type, and the tango that arises between the language of science and business. We need to respect and value scientists and engineers as domain experts – yes, we should be arming innovators to articulate the opportunity their ideas represent, but the world doesn’t need more business people to solve its problems!! The roots of new ideas start from a place of respect and trust. From here, relationships are fostered and the high impact work to turn ideas into opportunities begins. As with icebergs, change happens slowly so, be persistent but patient. The best initiatives are often the ones that spread virally and are not pushed from the top down. Once you start to chip away at that underwater iceberg, you’ll be surprised at what starts bubbling and percolating!